I’ve worked in the area of Westminster as a Westminster toastmaster on a number of occasions and have seen some amazing venues. London offers a whole host of fabulous and unusual places to host a wedding – there are all sorts of amazing locations for a reception. So, I thought I’d take a look through the web and see the sort of unusual places I could find and here they are. If you want a beautiful, white wedding with an array of natural light and an abundance of white, then Holland Park Orangery is right up there. The delightful room hosts 80 guests, so it’s great for smaller weddings and is just fabulous if you’re looking for a bright space. Obviously, the lack of room mea ns post dinner dancing is a little limited and loud music not ideal. However, I was recently a enjoyed an experience as a St Johns Wood Toastmaster and I’d suggest that f you can live without this venue is extremely charming. 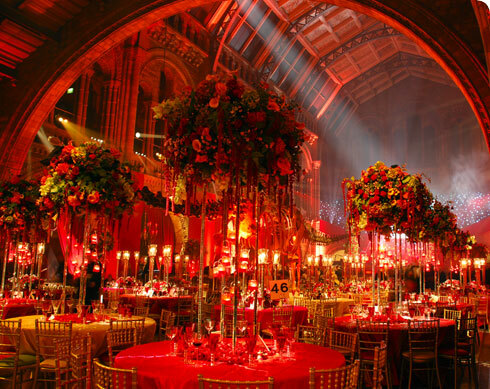 Yes, you can have your wedding reception is this fabulous building – underneath the skeleton of a dinosaur in fact. The Natural History Museum is probably one of the most beautiful buildings in London and has some of the most notable architecture in the city. This opulence comes at a price and a £15,000 hire fee is required, but the capacity is 650 people – so it’s perfect for large weddings. Another beautiful, elegant venue but one that though extravagant still manages to avoid being overly fussy. Kensington Palace Orangery looks into the gardens of the building. However, the terms are quite strict – no red wine. This could put a lot of people off and I’m not surprised. Art Deco and one of the most beautiful venues in London. Claridge’s private entrance to the ballroom is fantastic and there’s a fantastic area for receptions as well as a beautiful room to powder the nose. As someone who has experienced venues as a Westminster toastmaster working in that area I would say prices are steep but it’s a fabulous venue. A fabulous venue, this Georgian townhouse is just off Hyde Park Corner, so it’s very central. It’s there to be made up as you wish and the grand staircase is a fantastic eye catching piece. The venue needs to be hired, so the wedding party has to organise all aspects, however it’s got huge potential as a wedding venue. If you’re looking for a Westminster toastmaster or someone to work as a London Master of Ceremonies I’d be more than happy to do so – contact me.